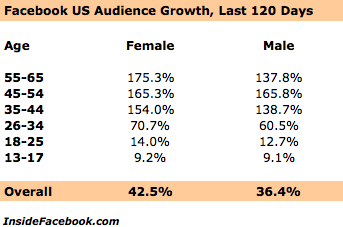 This shows that the fastest growing demographic on Facebook for the last 120 days is women over 55. However, notice that during the last 120 days, there has been triple digit growth on all females group over 34 years old. 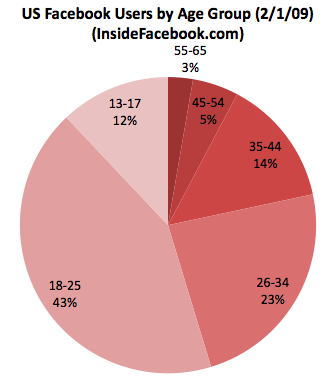 As of 02/01/2009, the over 34 age group (both male and female) of Facebook stands at 22% of all Facebook population. moms online in the U.S. today. However, online marketers need to be pretty careful (and have a lot of common sense!) when communicating with digital moms. One of the most common complaints of digital moms is that online marketers believe that they are all alike. The Razorfish report, Digital Mom, provides five useful core segments of socially connected moms and their implications for online marketers and social media specialists. Please notice that these 5 core segments are not to be taken as final definitions but rather as guidelines on how to develop a better understanding of digital moms. The Self Expressor is a mom who enjoys organizing and beautifying her personal profile page to reflect her ownunique style and to offer online friends an inviting place to visit. Her personal profile is often adorned with plentiful photos, her individually selected audio playlist, a custom skin reflecting her preferred design palette, and several social and expressive widgets to entertain her visiting online friends. Polls are one of her favorite ways to engage others on topics of interest and gather the opinions of many fairly quickly. She is also generous in responding to polls,and prefers the structured, efficient interaction these areas provide to completely free form conversation and blogging. Implications for marketers: To connect with the Self Expressor, marketers should focus on providing tools and functionality that help her design, organize, and present her online social world. As she incorporates the use of these tools on her personal homepage, brands also benefit from the integration on her personal social network real estate and the viral benefit of having her spread brand messages to her online friends. Marketers may also tap her creativity and get her directly involved in a campaign—particularly if they appeal to her more visually artistic design-related nature. The Utility Mom is inclined to join online groups—particularly her local school groups or other groups providing practical information, yet she is not a frequent contributor to the conversation. She enjoys the widgets on her profile page, especially games and quizzes she can play on a regular basis whenever convenient. As another informative and fun online diversion, she will answer other moms’ poll questions, but she will not venture to create and post any poll questions of her own. She is also reluctant to upload and share photos and has the lowest numberof online photos of any of the mom segments. 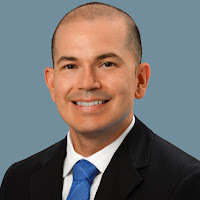 Implications for marketers: To connect with the Utility Mom, marketers should associate their brands with social network features she seeks out, especially game or quiz related widgets or poll activities. While the Utility Mom has relatively few online friends, she also values product related information from other moms like her. In fact, she values the purchase related information provided by moms like her much more than that provided by her online friends. Marketers should also tap mom influencers within the social network who share other commonalities to her Utility Mom profile (similar age kids, and personal interests), but who are more comfortable creating andsharing brand messages that will resonate with Utility Mom. She is a very active member of the online mom community. She joins more groups than any other segment, and she ismost likely to start a new group. She generously contributes to online forums, blogs often, and asks and answers questions. She is not inclined to share photos or respond to poll questions. Overall, she is not a very engaged participant in the social network. She enjoys reading blogs and viewing others’ photos, especially those related to being a new mom. This digitally savvy younger mom is also quite comfortable uploading photos and sharing images of her new baby online. Most of her interaction with the community is centeredaround asking and answering purposeful questions. Rarely does she write blogs or post comments in groups, chat with others, or even take the time to answer polls. Implications for marketers: Marketers looking to connect with the Infoseeker should align with the online features she is most engaging with like Q&A related content, product reviews, and even photo sharing areas. Brands that can tie in to the information she is seeking particularly on parenting issues and purchases associated with this lifestage – and do so through the highly credible voice of other moms (e.g. mom product review from another new mom like her), will be optimally received. She is an active social network member, connecting frequently with others through both the blogs she writes and the private messages she sends. More free flowing conversational areas are her favorite—responding to open ended journal questions, commenting on others’ posts rather than responding to multiple choice polls or specific member questions. The more visual aspects of expressing herself online are not as important to her; she under indexes dramatically on sharing photos and customizing her profile page. Great post! I’m definitely a “digital mom” and, like most mom’s that frequently scan the web, I do lots of online research for major purchases. Companies are missing the boat if they don’t find a way to reach moms. 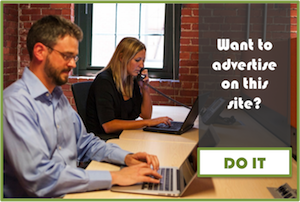 SEO, interactivity, web design, and social networking should be top priority for businesses. If it isn’t, the companies that make it a priority will have a competitive advantage that will leave others in their cyber dust! Thank you for the feedback Heather. What do you think about the 5 core segments suggested by the Razorfish study? Which one do you identify yourself with? Great blog! All your posts are extremely well thought out and original. Keep it up! I’m probably a cross between the self-expressor (love the visual aspect) and the and the hyperconnector (I love blogging). Thanks for asking. I really like the study. Nice post!